Come check out the rest of The Tour Schedule! Fresh off the plane and barely on American soil more than a handful of minutes, Francesca's face is recognized by TSA scanners to be a match for a child who was kidnapped twelve years ago. Brody Mason remembers the day Fiona Sullivan went missing during a family vacation in Italy and it's haunted him his whole life. So when Francesca shows up at the Sullivan farm down the road, he's compelled to figure out if this girl really is his long-lost friend. But Francesca knows she's not Fiona Sullivan. She knows exactly who she is. At least she thinks she knows – until Brody Mason relentlessly pursues her and she begins to have feelings for him. Maybe being Fiona isn't so bad? Losing Francesca literally sucked me in... and didn't let me out until I finished the last page. I loved the characters, mystery, romance, and the originality. (And I cannot let that gorgeous cover go unnoticed) I am so glad I got the chance to read this book, and I will definitely look into more of J.A. Huss's writing. 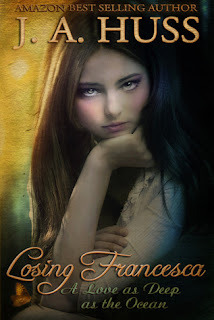 The characters were one of the main things that sucked me into Francesca's world, her new one and old one. She herself was quite a mystery at first, as the readers are not sure who her dad is, and other key factors of her past. This hidden information intrigued me. Also, I absolutely loved her narration and character development. She is stubborn, but is having a little bit of an identity crisis towards the middle of the book. I also loved Brody. At first, he seemed a little, er, dramatic? However, as I learned more about him, I began to crave the chapters with his narration. There are tons more characters I loved too. Shaun, Francesca's adoptive brother, was a character I loved. He had his faults, but I loved how he tried to include Francesca into the family. Also, I enjoyed learning about the family Francesca spent her life with before she was recognized as a kidnapped child. They were different and unique, yet had a realistic quality. To me both Shaun and Francesca's childhood family were very vivid. Now I must mention the plot. The whole time, I was pulled into the mystery of who Francesca really was. And there was an amazing twist at the end. I applaud the author for pulling such a sweet yet intriguing and suspenseful contemporary romance! Also, I loved the multiple settings and detailed yet not over-the-top descriptions. (NormallyI mention pacing and length but I do not have much to say as it was perfect here.) I believe I have said this word before in the review, but I found the story very vivid and as I read I lost sense of the reality around me. Overall, I found Losing Francesca more than worthy of my time. The book was, simply put, pretty amazing. I would not hesitate to recommend this book to fans of unique contemporaries! Or, really, any book lover out there. And now head down for an amazing giveaway... And put this book on your to-read-as-soon-as-possible imaginary hard drive. And don't deny it, all reader's have that list stored in their brains. Thanks for the great review and the giveaway! I don't have an answer for your question, though. lol. :) Your welcome! I hope you enjoy the book if you ever read it! Great review, Emily! I love a full cast that really pulls you in. I'm a big character oriented reader. The mystery aspect sounds awesome, too! Thanks! I am definitely a character oriented reader also. And the mystery intrigued me. And thank you so much for organizing this tour, and all the others! This looks like a really good book! It is! I enjoyed Losing Francesca immensely.